Kaakki Sattai's audio launch date!! What's new with Sivakarthikeyan's Kaakki Sattai? Well, the actor is now totally done with his shoot for the movie, and has also completed dubbing for it. The movie, originally titled as Taana, is almost done with its shoots with just a day's patchwork remaining. Kaakki Sattai is produced by Dhanush's Wunderbar Films and presented by Escape Artists Motion Pictures. 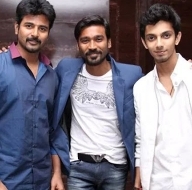 Music is composed by the team's 'chella pillai', Anirudh. The audio launch of the movie is said to be happening on the 20th of this month. The movie will see the actor in a cop's role and will have the earlier seen hit VVS pair of Siva - Sridivya. With a lot of buzz going around the movie, let's wait and watch what the team has in store for us! People looking for online information on Anirudh, Dhanush, Escape Artists, Kaakki Sattai, Sivakarthikeyan, Sri Divya, Taana will find this news story useful.